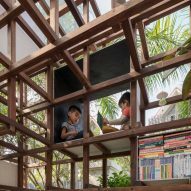 VAC Library by Farming Architects is a large wooden climbing frame that uses solar-powered aquaponics to keep vegetables, koi carp and chickens in Hanoi, Vietnam. 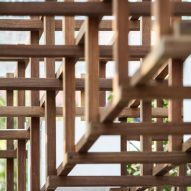 Koi carp swim in the pond adjacent to the structure, crossed via a series of concrete stepping-stones, and several chicken cages sit at the rear of the space. 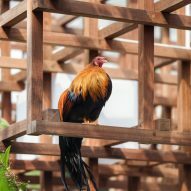 These chickens also contribute to the library's miniature ecosystem, providing eggs to eat and manure to fertilise the vegetables. 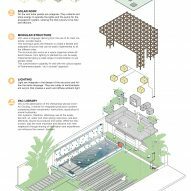 Aquaponics combines aquaculture – the keeping of fish – with hydroponics – cultivating plants in water, to create a cyclical system that uses waste-water from ponds as a nutrient-rich resource for plants. 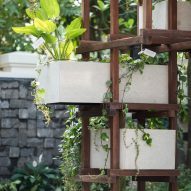 In turn, plants help purify water that is then returned to the fish ponds. 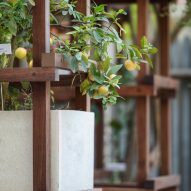 "Children will learn that Koi carp are not only pets to watch, but also how their waste can benefit the vegetable planters," said Farming Architects. 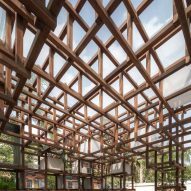 The structure itself is a modular wooden grid, designed to be adaptable to a range of different urban sites, topped by a roof with solar panels. 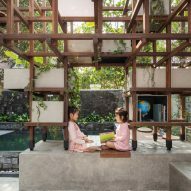 Simple concrete seating areas provide space to sit and read, with the floor surface extending to produce a square in front of the structure. 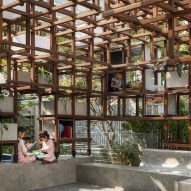 Various elements are slotted into the gaps of the structure's wooden beams, such as acrylic boxes housing lights, planters for growing vegetables, and shelving units containing children's books. 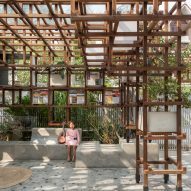 Farming Architects developed the idea based on small interventions people in Hanoi make in their own homes, such as ponds for fish or planters for growing vegetables. 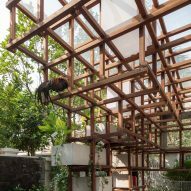 "The aim is not only to produce an effective use of resources, but also experiment in using different types of plants and animals in an urban environment", said the architects. 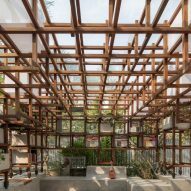 The project's name is an acronym of three Vietnamese words: Vườn (garden), Ao (pond) and Chuồng (cage). 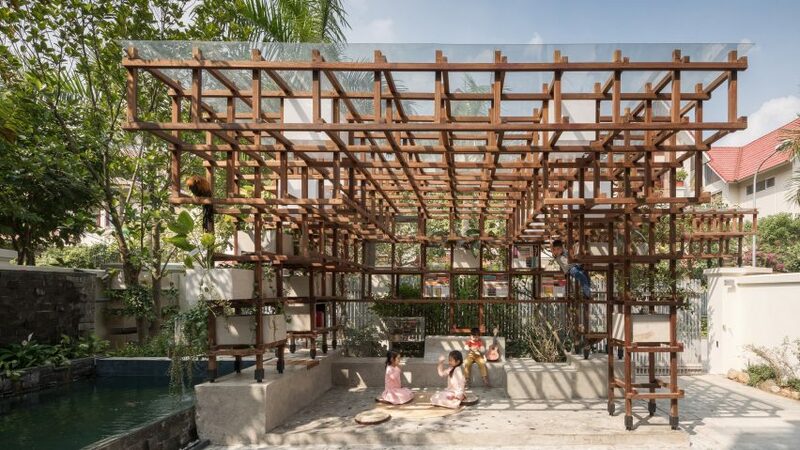 Farming Architects have previously used the concept of a self-sustaining ecosystem at a cafe in Hanoi, which features a waterfall, fish pond and vegetable patch. 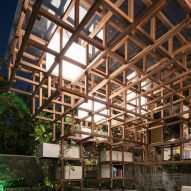 Similar concepts have also been used in a proposal for vertical farms in Shanghai, and a pop-up farm created by Space10, IKEA's innovation lab. Photography is by Thai Thach and Viet Dung An.